Australia is home to such a versatile range of quality protein powders and it can be quite difficult to decide which is the best. This article would hopefully make things a little easier for you by giving you a top three list of the best protein powder of each of the major protein categories. Blended whey proteins are among the most versatile protein powders for helping to build lean mass. They are arguably the most popular subcategory of protein powders and countless Aussies go through kilos of this stuff all year round. In this category, the following three products deserve mention, in no particular order. Americans popularised the 100% whey protein blend category, and Maxs SuperWhey was the Australian product that beat the Americans at their own game. SuperWhey uses a formulation that looks fairly similar to industry giants Optimum Nutrition Gold Standard 100% Whey Protein. It matched the Optimum product punch for punch in regards to quality and nutrition specs, but when it came to flavour, there was really no competition. Even today, SuperWhey is considered to be one of the best tasting protein powders around. This, combined with a vitamin and mineral complex makes SuperWhey a fantastic Australian made product. Elemental Nutrition have always been a very innovative company, using some of the most unique and cutting edge ingredients. 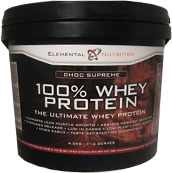 Strangely enough Elemental Nutrition 100% Whey did not see shelves until relatively recently. However, once it arrived, it did not take long for this product to quickly rise to the top of the list of most popular whey proteins. Elemental 100% Whey contains the same high quality ingredients as those you would expect from any world famous protein powders, but its real party piece is that Elemental are able to keep prices down despite giving you so much quality. Unlike the others on the list, Redbak Complete Protein is not a 100% whey protein. This powder contains whey protein isolate, whey protein concentrate, caseinate, added amino acids, milk protein concentrate, and egg albumin. This blend of ingredients provides a range of fast to slow release proteins that makes Complete Protein highly versatile. Despite such an extensive list of ingredients, Redbak have managed to keep the protein content very high, reaching over 80%. This is a major achievement for a blended protein of this variety and is a testament to the quality of ingredients. For those that are looking to shed some fat and increase muscle definition, a weight loss protein is the way to go. These proteins tend to be very lean, containing a high amount of protein and a very low amount of carbs and fats. In addition to this, they contain a mixture of ingredients to increase fat burning, and therefore providing the perfect two in one weight loss aid. Compared to products from other countries, Australia is a real class leader, and only recently have the Americans started to also join in on this category. Elemental Nutrition Shredding Matrix is one of those products that defines its product category. Not only does it contain an excellent protein blend, it is also contains one of the highest concentration of fat loss ingredients compared to other proteins. These include hydroxy citric acid, l-carnitine, caffeine, Citrus aurantium, and green tea extract. Again, like all Elemental products, this one is also reasonably priced and tastes more than good. 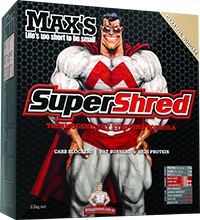 Suitable for both men and women, Shredding Matrix sees loyal followers and countless repeat purchasers. 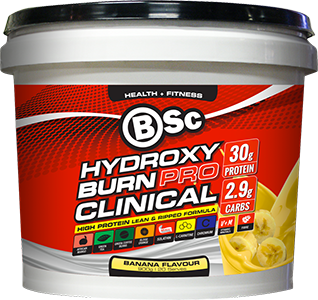 BSc HydroxyBurn Pro Clinical is possibly one of the most comprehensive fat loss protein powders on the market. The original formulation was criticised for being too high in carbs, but a reformulation has fixed this problem. It provides a total of 10 different fat loss complexes each designed to target fat loss from different angles. Other than being a high protein, low carb, and low fat shake, HydroxyBurn is also high in fibre to help you feel fuller for longer. This milkshake textured powder is thicker than the other products on the list and provides a fairly satisfying meal or snack replacement. Much like HydroxyBurn, Maxs SuperShred is another very comprehensive fat loss protein powder. What really sets this product apart is its outrageously high percentage of protein. Very rarely are you able to find a weight loss protein powder that exceeds 90% protein, in the way that SuperShred does. SuperShred contains a negligible amount of fat and carbs, which means that it is almost completely lactose-free, making it suitable for even those with severe lactose intolerance. This is a more premium product compared to the others and is therefore slightly more expensive. For times of the year when bulking and building mass is critical, a high quality mass gainer will make the difference between average gains and some building some solid mass. In Australia we do things differently to the Americans and rarely do we opt for calorie and carbohydrate loaded products, instead, our mass gainers are more subtle and focus more on quality gains instead of just brute force. 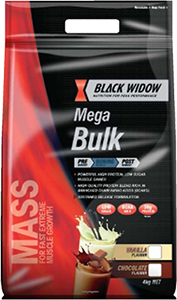 The real charm to Black Widow Mega Bulk is the fact that is one of the simplest lean mass gainers around. In an age where more is perceived to be better, people often forget how effective things can be when going back to basics. Mega Bulk contains only whey protein concentrate, whey protein isolate, maltodextrin, and some added glutamine and taurine. The carb to protein ratio is kept low, at 1 to 1, making it great for those looking to minimise fat gain. As expected, this simple product is also among one of the best value for money around. So if you want something that uses quality ingredients that won’t break the bank, then Mega Bulk is the one to go for. 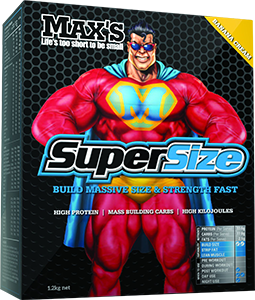 Maxs SuperSize contains a good smack of carbs for building mass without going too overboard. It contains a carb to protein ratio of 2 to 1, which is actually something quite hard to find with American products. This ratio is great for the average person looking to build some mass. Much like Mega Bulk, SuperSize keeps things simple with only a small selection of quality and effective ingredients. 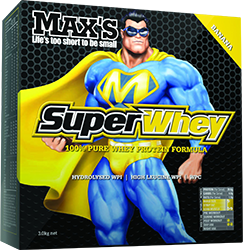 Much like many other Maxs products, SuperSize is a vitamin and mineral fortified product, which can help to plug some minor deficiencies, making it a well-rounded product. Finally, value for money is still there for those that are on a budget. Is a premium mass gainer that contains more than just protein and carbs. Using three carb sources and four protein sources, Elemental Nutrition Anabolic Mass provides a comprehensive spectrum of ingredients from fast to slow release. The protein to carb ratio is similar to Maxs SuperSize, which is around 2 to 1, but this is not what separates Anabolic Mass from the competition. It is actually one of the only mass gainers around that also has a very potent built in testosterone booster component, which can help complement the effects of the nutrients to help with muscle building. This unique Australian product is a serious contender for one of the best mass gainers ever.